The country that backdrops the town of Redlodge is a stunningly beautiful panorama of the first order in a state that has a lot of them. 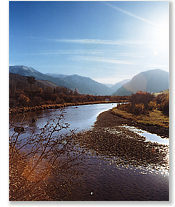 This is the land of what we call gaspin material For example, as you drive to Cody, WY (65 miles) you turn south, into the Clark Fork of the Yellowstone Valley, and the gaspin reflex kicks in. The sweeping ranch country set in valleys 80 miles wide with rivers that run cold and clear, snowy mountain peaks and plateaus, high mountain lakes, the mesas and canyons, this country which surrounds the town of Red Lodge can wear out the gaspin reflex in a day. The Beartooth/Absraoka Range is capped by Montanas tallest mountain, Granite Peak at 12, 799 feet. From the top of Red Lodge Ski Area, this peak can be seen along with 4 other mountain ranges. This is a state in which cows outnumber people 3 to 1. There is no place like Montana, the last best place. Wed like you to see this side of paradise.